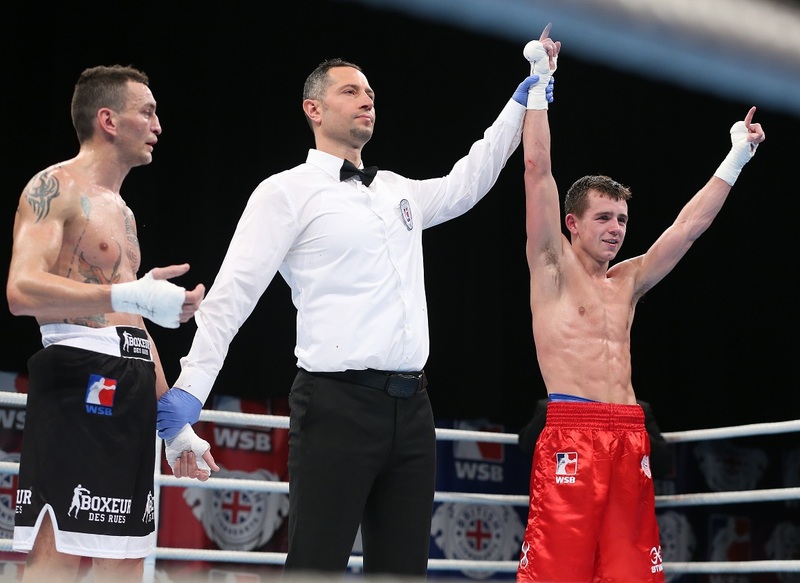 A dominant display by hometown favourite, Peter McGrail, capped a triumphant performance by the British Lionhearts as they defeated Italia Thunder 5-0 in the World Series of Boxing (WSB) last night in Liverpool. McGrail, displayed his trademark elusive movement and fast hands to outwit the experienced Italian, Jahyn Parrinello, in the last bout of the evening to delight a partisan home crowd. The European champion used his southpaw jab to control the fight and consistently drew his opponent onto his left hand, repeatedly catching him with a series of heavy shots on the way to a unanimous victory. Wins for Galal Yafai, Luke McCormack, Ben Whittaker and overseas selection Radoslav Pantaleev completed the rout as the British team recorded its second consecutive whitewash following a 5-0 win over the Croatian Knights in Gateshead two weeks ago. McGrail said: “I thought I boxed well. He was a tricky opponent, very experienced, but I thought I landed a few good shots and did not really get hit that much. “A win is a win and I am happy to get that under my belt going into the Commonwealth Games which is coming up soon. The evening began with a routine victory for Rio Olympian, Galal Yafai, who defeated Federico Serra at light-flyweight. At light-welterweight, Luke McCormack looked to have the beating of Italy’s Paulo Di Lernia but a clash of heads in the fourth round left the Lionheart’s man with heavy bleeding above his left eye. McCormack used his ring craft to protect the cut and see out the contest, scoring a split decision win to give the Lionhearts a 2-0 lead. A superb WSB debut by Ben Whittaker made it 3-0 and ensured victory on-the-night for the Lionhearts with a fourth round stoppage of Guiseppe Perugino in the middleweight contest. The British man used his height and reach advantage to dominate the Italian before flooring him with an overhand right in round four to mark a dream first appearance in the five round format. Whittaker said: “As soon as I came out I dominated the centre to let him know he is not going to push me back. Once I got him on the backfoot, I knew I had it. “He was trying to lure me in and do little things to get me to reach in but I kept to my own style and in the end I think it was me frustrating him because he couldn’t hit me. A solid win by the Lionhearts’ overseas boxer, Radoslav Pantaleev, in the heavyweight contest made it 4-0, as the Bulgarian outworked Italy’s two-time former world champion, Clemente Russo. It was left to hometown favourite, McGrail, to complete the whiteswash and the Everton Red Triangle boxer did not disappoint as he delivered a comprehensive win over Jahyn Parrinello. Boxing in Liverpool for the first time in more than three years, McGrail was too fast and clever for the streetwise Italian. He refused to get drawn-in by Parinello’s spoiling tactics and showed superior boxing skills to dominate his opponent on the way to a unanimous victory. It means the Lionhearts now have three wins from four matches and are well placed to reach the quarter-final stages of the competition. The teams will meet again in a fortnight for the away leg when Italia Thunder host the Lionhearts in Milan on 16 March 2018. The Lionhearts next home match will be against the France Fighting Roosters at the Newport Centre in Newport on Saturday 14 April 2018. Tickets are on sale now at www.gbboxing.org.uk/tickets. The British Lionhearts team is supported by UK Sport. More details on the Lionhearts and WSB are available at http://www.worldseriesboxing.com/ and by following the team on twitter at @Brit_Lionhearts.